But while resources and skilled labor are in short supply, the global population is increasing (to nearly 10 billion people by 2050), and poverty is declining in developing countries. In 1990, less than a quarter of the world’s population earned enough to be defined as middle class. Today, nearly half do, and every day, 400,000 more people join the global middle class. Rising living standards should be celebrated, but consider how consumption impacts design, engineering, building, and manufacturing. Every year, more people desire, demand, and need things like cell phones, cars, food, and housing. 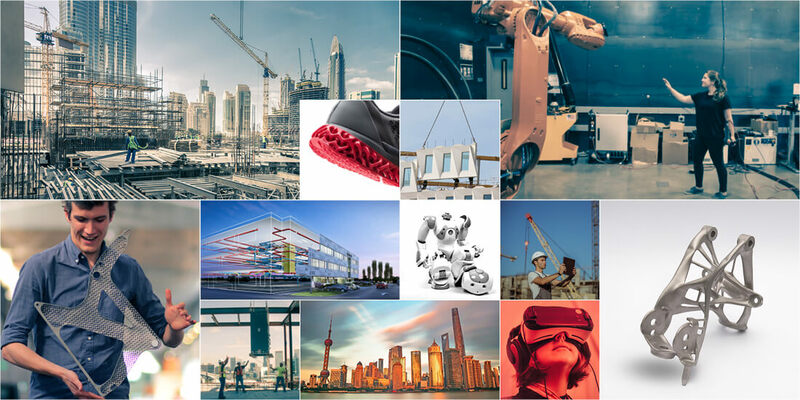 According to research firm Statista, as the global population grows and urbanizes, the construction industry will need to build an average of 13,000 buildings in major cities every day through the year 2050. And that’s a fraction of the trillions of dollars the world will need to invest in building new infrastructure, but the world is not static. Its existing infrastructure needs constant refurbishing and refreshing. Things like buildings, bridges, and refrigerators need to be constructed and manufactured to stand the test of time rather than contribute to landfills at an alarming rate. How will the world sustain life—humanely—with less negative impact? It’s a massive creative and logistics challenge. Construction generates nearly a third of global waste, and that volume is expected to double by 2025. And while the manufacturing process is increasingly efficient, the supply chain is surprisingly wasteful. Roughly 70 percent of the spare parts manufactured today aren’t even used. In the pursuit of more, people waste warehouse space, materials, and money. Consider what happens if the global population doesn’t fundamentally rethink how it makes things. With the growing population and swelling middle class, along with the mounting effects of climate change, dwindling natural resources, and a skilled-labor shortage, how will the world sustain life—humanely—with less negative impact? It’s a massive creative and logistics challenge. But as design challenges go, it’s the biggest opportunity designers and makers have ever had. With more growth comes more pressure, but as people reconcile the inevitability of more (a byproduct of demographic shifts) with the reality of less (finite labor, skills, and natural resources), reimagining the future of automation can offer a new way forward—a better one. It’s no longer sufficient to reduce waste and inefficiency through the old model of automation that focused on optimization. The world now has bigger problems to solve, which will require imagining a new model of automation, focused on more human-machine collaboration and creativity. This new automation model is an opportunity to do something better—with less inequality, less disruption to businesses, and less harm to the planet’s communities and environment. It’s about new construction and manufacturing processes with less waste and better outcomes. And it’s about giving workers more attractive and better opportunities. Using generative design, General Motors engineers created a lighter, stronger seat bracket that comprises just a single part. Courtesy General Motors. It can be done when humans and machines cocreate and learn from one another, which will lead to more meaningful and innovative work. With the convergence of manufacturing and construction, robots are no longer constrained to factories. They’re moving from the production line to the construction site. And 3D printing isn’t constrained to prototyping; in aerospace and automotive, additive manufacturing is increasingly production proven. Most important, human ideas aren’t constrained. Creativity can be unleashed to create products, buildings, and cities that perform better and last longer. The evolution of General Motors (GM) exemplifies this new automation approach. The carmaker has been a pioneer of automation ever since the first car rolled out of one of its factories. Today, at some of GM’s plants, a new car rolls off the assembly line every minute, the result of an intricate industrial symphony requiring more than 30,000 perfectly engineered parts. But making more cars isn’t the biggest challenge for GM anymore, which is why the company has adopted a road map for electric vehicles and a future without the negative impact of emissions. This means making cars lighter and stronger by improving efficiency and reducing weight and mechanical complexity. Smarter, more innovative design and manufacturing processes mean less waste and better, longer-lasting products. See what it will take to build for a 10-billion-person planet. To accomplish its vision, GM adopted Autodesk’s generative design technology, which radically transformed how it designs and makes parts. This process allows the company’s engineers to set parameters for better designs—such as how parts connect to each other and the maximum loads they need to withstand—and rapidly test out better solutions. 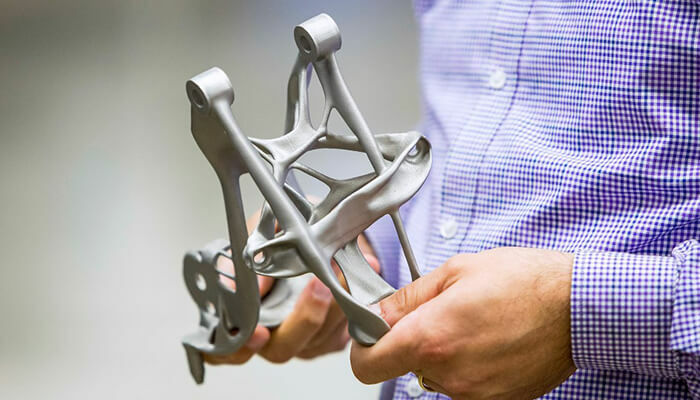 At GM’s Tech Center in Warren, Michigan, generative design helped engineers reimagine the humble seat bracket, creating a part that is 40 percent lighter, is 20 percent stronger, and comprises a single component instead of eight pieces. This means less weight; fewer part suppliers; less complexity; less work; and, ultimately, a car with improved fuel efficiency and a smaller footprint. For GM, rethinking automation is not just about the incremental improvement of a single part or achieving efficiencies by making some parts redundant. It’s about taking an exponential leap—changing its processes, vehicles, supply chain, and entire ecosystem. Generative design and metadata tagging enabled construction firm Van Wijnen to develop modular housing components that can be built on an assembly line and used in thousands of configurations. Courtesy Van Wijnen. Automation and generative design also have the potential to revolutionize the construction industry. 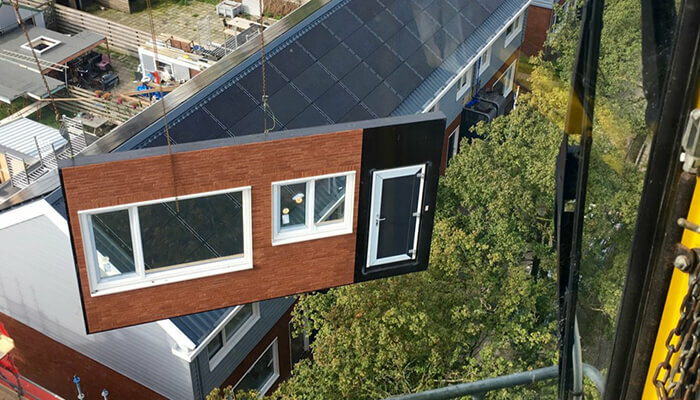 Construction firm Van Wijnen specializes in constructing affordable, net-zero-energy housing in the Netherlands. And while the company’s mission is noble, the 2 percent profit margin it was chasing wasn’t enough to sustain it. Fortunately, generative design helped Van Wijnen adopt a more automated, efficient process that eliminated waste and lowered costs. The company tagged building components with metadata, allowing it to develop a modular concept for housing that could be used in many configurations. Based on constraints such as backyard size, views, solar-energy potential, and cost and profit, generative design allowed Van Wijnen’s designers to explore 15,000 different design options to create the perfect urban neighborhood. The result, a modular-building system manufactured similar to an automotive assembly line—allows Van Wijnen to reimagine housing designs with a new production process. Generative design helped cut waste, create more energy-efficient homes, optimize layouts to meet the needs of occupants, and make the company more money. With help from automation in the design process, Build Change can deploy local Columbian construction crews to retrofit and build earthquake-resilient homes faster. Courtesy Build Change. These approaches can do so much more, especially for some of the world’s most at-risk communities. 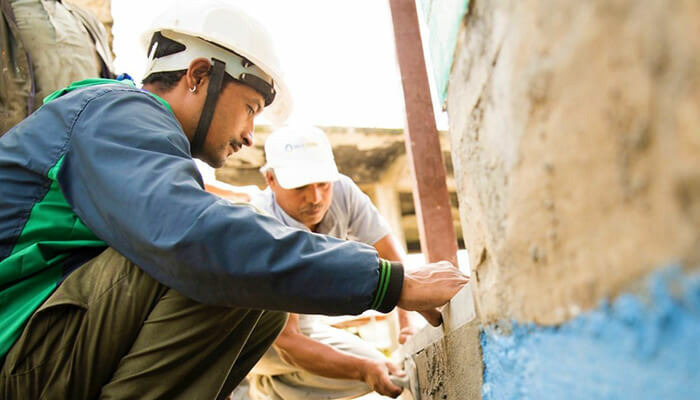 In Colombia, Autodesk worked with the nonprofit Build Change to automate the process of surveying, retrofitting, and redesigning buildings on the country’s many fault lines—to make the next generation of homes more resistant to earthquakes. Millions of Colombians live in dense urban areas near one of the world’s most active fault lines. By automating the process of redesigning and retrofitting homes, the organization changed not just how construction teams worked but what they worked on. Time once spent diagnosing problems could be dedicated to fixing them. For example, using Autodesk Revit and Dynamo, Build Change cut down the retrofit design process from almost one week to less than three hours. Automation changes how people work, but it also changes how they live. GM can create lighter, more fuel-efficient cars to combat climate change. Van Wijnen can build more sustainable and affordable homes. And Build Change can build more resilient homes faster. Automation also helps companies stay ahead of their competitors, but more important, it encourages and supports the imagination that moves humanity forward. Better cities, better buildings, better things, better work: Reimagining the model for automation can balance the inevitability of more with the reality of less—while realizing the opportunity for better.